Dry eyes, often referred to as “Dry Eye Syndrome”, is a very common complaint. About 15% of the population, in all ethnic groups, experience varying degrees of Dry Eye Syndrome. It can also be a sign of digestive imbalances, or of more serious systemic autoimmune diseases, such as Rheumatoid Arthritis, Sjogrens Syndrome or Lupus Erthematosus. The Mucus Layer – the closest layer to the corneal epithelium. This is produced by the conjunctival goblet cells, and is absorbed by the corneal surface glycoproteins, creating a hydrophilic corneal surface. The Aqueous Layer – between the Mucous and Lipid layers. This comprises of 90% tear film. It is secreted by the lacrimal gland and incorporates all water-soluble components of the tear film (slightly alkaline at pH of 7.4). The Lipid Layer – the most superficial layer. The Meibomiam glands produce it with minor contribution from other glands. 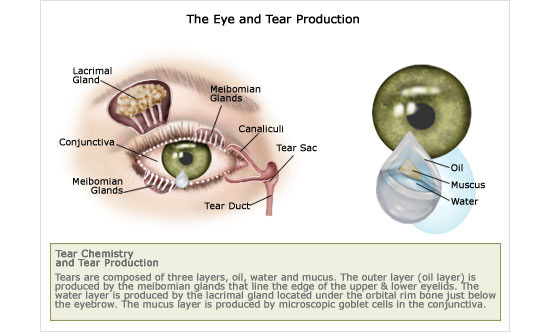 The secretion is a sebaceous fluid at body temperature, and stops evaporation of the aqueous layer, thereby allowing tear film to mould itself to the eye’s surface. The typical symptoms include dryness, grittiness, irritation, difficulty reading for long periods of time, burning and even the seeming contradiction of excessive tearing or watering. 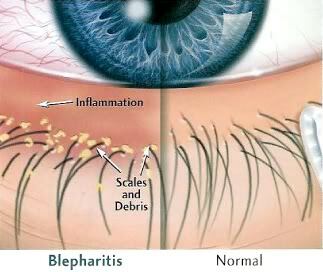 Blepharitis is an inflammation of the rims of the eyelids, which causes them to become red and swollen. It is very common, accounting for an estimated 1 in 20 eye problems reported to GPs. Blepharitis is more common in people over 50, although it can develop at any age. It is not possible to catch Blepharitis from someone else who has it. Holistic treatment options start by identifying the potential cause, as this can be very individual. The most common causes are dehydration, hormonal imbalances, allergies, autoimmune conditions, acute/chrinic infections, prescription medication side effects, and environmental exposure. Natural eye drops may help in the short term, but will only act as a bit of a ‘sticking plaster’! It is the underlying cause that needs correcting. Once an underlying cause is identified, or at least suspected, HealthPoint acupressure can do its job efficiently, treating stimulation points relating to those causes. HealthPoint has been found to be extremely effective anecdotally and scientifically for many types of eye problems and their symptoms, often with fast relief. Of course it is equally important to ensure dietary improvement.